Italy and Norway move top of their groups in the ICC World T20 Europe qualifier. All three abandoned fixtures from Match Day 1 are completed to move event back on schedule ready for tomorrow’s play. The six teams in Group A enjoyed a rest day with no fixtures outstanding. Denmark sit 2 points clear of Germany and Austria with three wins out of three at the half way stage of the event. Only one fixture from Group B was re-scheduled to today’s reserve day, with a top of the table clash between top seeds Jersey and Italy. Italy chased down Jersey’s total of 112 with 2 overs and a ball to spare, with player of the match Jaspreet Singh scoring 32 including three 6’s and a 4, as well as taking the wicket of Jersey dangerman Jonty Jenner. The win moves Italy clear of Jersey and Belgium at the top of Group B. In the first of two re-scheduled matches in Group C, Norway hit 150/6 in their 20 overs, including 38* for Faizan Mumtaz. This proved too much for Sweden, as they were bowled all out for 94 to record a 56-run victory for the Norwegians. In the Group’s other match, Israel posted 161/7 in 20 overs with Emanuel Solomon hitting four 4’s and seven 6’s on his way to a remarkable 70 in 31 balls. 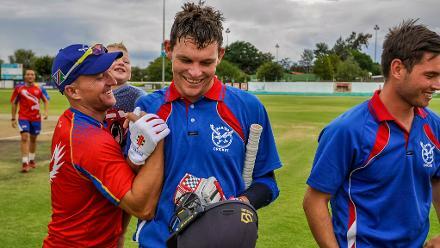 In response, Gibraltar’s batsmen struggled to score runs, despite the best efforts of captain Matt Hunter who scored a respectable 41* in 45 balls. In the end, Gibraltar ended on 109 from their 20 overs, giving Israel their first win of the tournament. Tomorrow sees another full schedule, with 12 more fixtures happening across the three groups.